While the Amazon Echo ecosystem continues to grow with more devices like the touchscreen Echo Show, Alexa’s skills are also on the rise and now number more than 15,000. If you don’t know what skills are, just think of them as voice-activated apps that provide pretty much any service imaginable. Even though 15,000 is quite impressive, not every skill is a winner. In fact, many skills are simply not so smart. For every useful skill, there are three or four skills that literally just play fart noises. That makes it hard for any newcomer to find practical and useful skills that fit their needs. 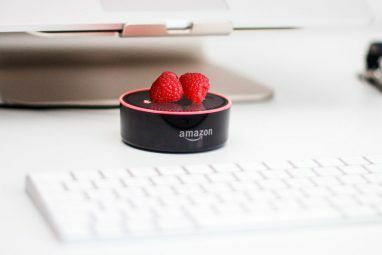 In this article, we’ll show you the best and most essential skills for Amazon Echo and Alexa devices. After finding that perfect skill, the next task is to enable it. Thankfully, there are more than a few ways to do that. The easiest way is to simply ask and say “Alexa, enable [skill name]” using any Echo device. That will work for many skills that don’t require you to login to another service. You can easily find skills either on the Amazon site through the Echo skills portal or by using the Alexa Android or iOS app. On either version, hit the sidebar menu and look for Skills. You can then search and install any skill by hitting the Enable button. To help anyone new to Alexa, we’re highlighting 15 great (and completely free) skills that should be the first skills you install on any Echo device. While you can add a wide variety of news sources to Alexa’s customizable flash briefing, CNN also offers its own standalone Alexa skill. You can ask about specific topics or just cover what’s making headlines. 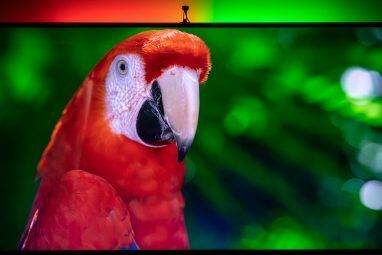 On the Echo Show Seeing Is Believing: The Amazon Echo Show Review Seeing Is Believing: The Amazon Echo Show Review Does a voice assistant speaker really need a touchscreen? The $230 Amazon Echo Show certainly makes a compelling case, with video flash briefing skills, song lyrics, and on-demand streaming of supported security cameras. Read More , you can even watch specific videos and rewind or fast forward with a voice command. Once you’re caught up on the most recent news, you can dive right into everyone’s favorite quiz show, Jeopardy!. There are clues from a wide variety of categories like sports, travel, history, and more. Just like a real contestant on the show, you’ll have to answer in the form of a question. While the built-in weather skill accessible through Alexa is accurate, Big Sky takes it a step further. Using the popular Dark Sky API that powers the popular weather app for iOS and Android and the Forecast.io Forecast.io: The Elegant Weather App For The Globe That Shows The Merits Of Good Design Forecast.io: The Elegant Weather App For The Globe That Shows The Merits Of Good Design A weather forecast website should be designed to make gloomy weather a bit palatable. 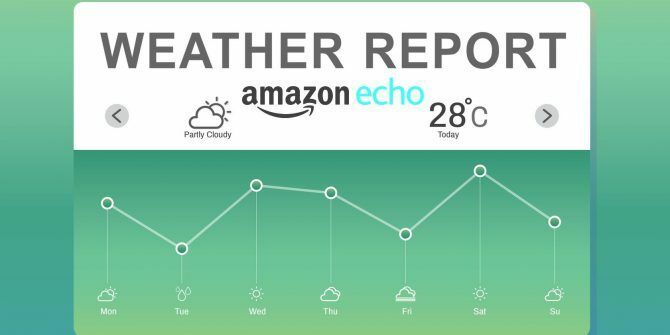 The appropriately named Forecast.io ticks most of the boxes; including the one that says – elegance. Take the first look at... Read More site, you can access hyper-local forecasts that are tied to your specific street address. You can also find out specific information like the chance of precipitation at a certain time of day. Snagging dinner doesn’t have to be a chore, especially if you’re in the mood for pizza. With the Domino’s skill enabled, you can reorder your last pizza or any other easy order. After the order, you can track each stage of the yummy pie, all the way until it’s being delivered or ready for pickup. If you’re a fan of Pizza Hut instead, they offer a similar skill available. Anyone with an Echo Show and a Nest camera Practical Uses for Your Home Surveillance Cameras Practical Uses for Your Home Surveillance Cameras Home surveillance cameras are getting more popular with each passing year as technology improves and prices drop. Here are some practical uses for home security cameras, some which may surprise you. Read More at their home will definitely enjoy this skill. After saying the camera name, the live feed will appear on the touchscreen of the device, perfect for seeing who is at the front door or what’s happening in the baby’s room. Later this year, on the rest of the Echo line, users will be able to hear the audio-only feed from those cameras. Anyone with a Fitbit fitness tracker 13 Fitbit Fitness Tracking Tips You May Not Be Using Yet 13 Fitbit Fitness Tracking Tips You May Not Be Using Yet Your Fitbit is there to help you achieve your fitness goals. There are a few more things you can get out of your favorite fitness tracker. Try these Fitbit tips today. Read More can check in on their progress towards specific personalized goals with this skill. You can learn a general overview of your day, how well you slept last night, the number of steps you’ve taken so far today, and more. 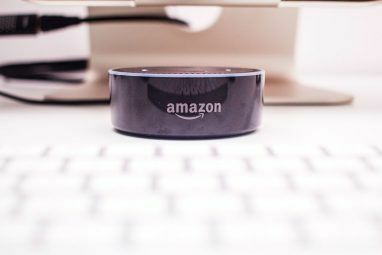 It shouldn’t come as a huge surprise, but there’s even a skill that can help find other skills 7 Creative Uses for Amazon Echo and Alexa 7 Creative Uses for Amazon Echo and Alexa You’ve seen the ads starring Alec Baldwin, but you're still not sure what Amazon Echo does or whether you need one in your home. We’re about to find out. Read More . After enabling, you can discover new skills every day. You can also find out about the newest additions to the skill catalogue, hear about the day’s top skills, and even learn about skills in specific categories. We’ve all lost our phone at the most inopportune moment possible. Now, instead of a panicked search through your home, simply open this skill to save the day. Once set up, Where’sMyPhone will call your device so you can track it down under the couch cushion or elsewhere. Just to note, if your phone is on silent or vibrate mode, the skill won’t work. A similar skill, TrackR How to Find a Lost Phone With an Amazon Echo How to Find a Lost Phone With an Amazon Echo If you ever lose your phone, you can use this app in conjunction with Amazon Echo to locate it on demand no matter where it is. Read More , will accomplish the same task but requires a few more steps including downloading a companion app. After eating all that pizza, Alexa can even help you burn off some calories. The 7-Minute Workout will guide you through an entire routine of 12 different exercises. If the workout gets too much, you can pause it and resume at any time. The developer is promising that a future update will add a mode with more difficult exercises. All you need is the airline name and flight number, and you can hear an up-to-the-minute update on any flight. This skill is perfect for when you’re running out the door on the way to the airport to pick up a friend or to catch a flight yourself! This is the perfect skill for any podcast fan 5 Most Popular Podcast Formats: Which One's Right for You? 5 Most Popular Podcast Formats: Which One's Right for You? Your podcast could probably be better. Choose one of these five compelling formats and increase your number of listeners in no time. Read More . Along with being able to subscribe and unsubscribe to specific podcasts with ease, you can even request listen to specific episodes. Additional Alexa commands can help you navigate through each podcast by rewinding, fast forwarding, and more. When you’re not sure what to make to eat, the Best Recipes skill can save the day. Just say what ingredients you have to work with and the skill will provide up to three recipes. You can narrow down options by meal so you can hear specific choices for breakfast, lunch, or dinner. You can choose to have Alexa read the recipe to you, or have her send you the recipe via email. When it’s game time for the whole house, you can fire up Would You Rather For Family. The game is fun and easy to play as you have to choose between one of two options for each question. As the name suggests, all of the questions are family friendly. Alexa can even be put to good use in the living room. If you have a Logitech Harmony Getting the Most Out of Your Logitech Harmony Elite Getting the Most Out of Your Logitech Harmony Elite So you’ve purchased a Logitech Harmony Elite. Here are some of our favorite ways to use the universal remote controller in your home. Read More hub and remote, enable this skill and you’ll never need to touch a remote again. After turning on the TV with a voice command, you can change channels, control the volume, play/pause content, and more. At the end of the day, Alexa can even help you to fall asleep peacefully 7 Secrets to Sleep Peacefully, According to Science 7 Secrets to Sleep Peacefully, According to Science A perfect night's sleep is not as difficult as you might think. We've compiled this list of ten science-based tips and tricks for helping you fall asleep. Read More . As its name suggests, Sleep and Relaxation Sounds features more than 40 different high-quality sleep-enhancing sounds to select from. You can choose from everything from white noise to crickets, city sounds, and more. To limit the time the sound is active, you can also set a sleep timer. After installing these 15 skills, you should be well on the way to experiencing everything the Amazon Echo ecosystem has to offer. And if you’re looking for more ways to use Alexa, there are thousands of more skills to try! Is there an Amazon Alexa skill you can’t live without? Did we miss an essential skill? Let us know in the comments.